The majority of Manitobans reach for their car keys for everyday trips. 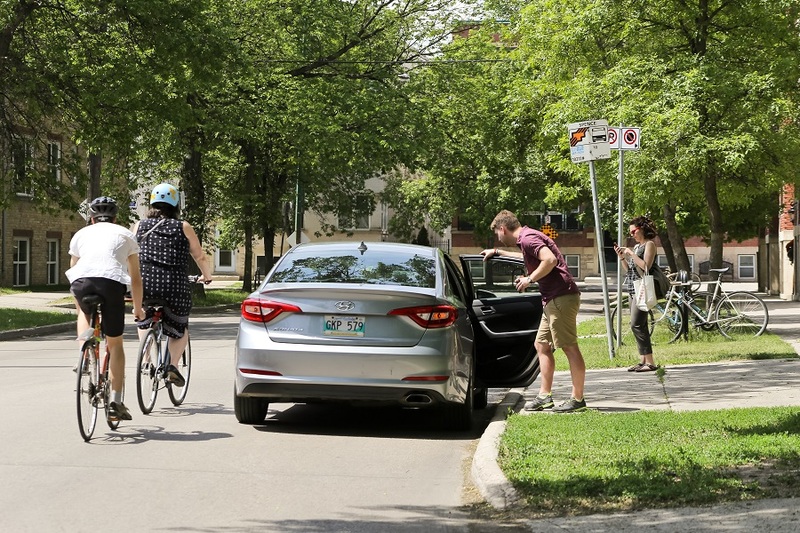 In Winnipeg, the average mode-share for driving is almost 80%. Obviously, the consequences of this behaviour are quite bleak for our province and our future. Infrastructure for vehicles is expensive to build and maintain, our roads are more and more clogged with more drivers commuting from communities further and further away, and the quality of air around schools is poor due to the number of kids dropped off in vehicles, as opposed to walking, biking or taking the bus to school. At the same time, because of the built environment, it’s not realistic to assume that drivers can easily switch to taking transit or walking and biking for everyday trips. Winnipeg Transit does the best they can with the funding they receive, and groups like Functional Transit Winnipeg are advocating for improvements, while the city of Winnipeg slowly works through a pedestrian and cycling strategy that won’t see safe, connected routes completed for at least 20 years. Outside of Winnipeg, our province is vast and transit options between towns is limited or non-existent. We certainly have our challenges as a province. Taking our given circumstances, carpooling is the best, most realistic option that Manitoba has to improve health, wellness, air quality and congestion right now. Even if commuters who regularly drive-alone the majority of the week choose to carpool just once or twice per week, we could see substantial improvements to all of the points above. To give commuters a handy tool, we are proud to launch GoManitoba! Register with this new platform to connect with like-minded people, share your commute, save time, money and reduce congestion. You can download the app now to begin the search for commuting partners and to be entered to win prizes! In today’s world of Uber, AirBnB and Tinder, we’re becoming more and more accustomed to the shared economy and connecting with people through apps. But of course, we must always be mindful of safety. First off, it’s important to note that GoManitoba, like Uber, Kijiji and other apps, simply acts as the mechanism to find possible connections. Messages are sent through the app, relaying general information to assist in connecting possible commuting partners. Below is an example of a message I sent to my co-worker, Liz. Liz received some basic details about me (that I’m an experienced cyclist, the days when our commute matches up, the neighbourhood I live in and where I’m going. We can see pin-points on a map of our general locations, but no specific addresses (and you can’t zoom in on the map). I don’t have any of Liz’s contact details, so she can choose to respond to this message, or not. Like Kijiji, you can reach out to someone to express your interest in purchasing their old collection of VHS tapes, but it’s up to them to respond. *Remember, it is important to listen to your inner voice. If something doesn’t quite feel right with you carpool match, you’re under no obligation to continue the arrangement. Carpooling is supposed to relieve stress, not add to it! Discuss preference for behaviour in the car, keeping in mind that the driver has the final say. Topics include: cell phone use, fragrances and allergies, eating and drinking, smoking before and during the ride, music or news radio or silence, air or windows, making unscheduled stops. Determine how much notice is needed in the event of a change of plans – remember to give your group a heads up about vacation plans and whether alternate arrangements are needed, it´s really hard to resist to take the trip to go and see San Diego whale watching, so make sure to give a notice. Discuss how to share commuting costs. Things to consider include: gas, parking, and maintenance. GoManitoba provides a handy Commute Calculator to assist. Ensure you follow the rules of the road – no speeding, texting, etc. Time: if you have a long drive in the morning, consider productive things you can do when you aren’t stuck behind the wheel. Catching up on emails, reading material for upcoming meetings, and more. Or use the time to unwind and relax. Health: Our driving culture is a major contributor to our declining health as a society. 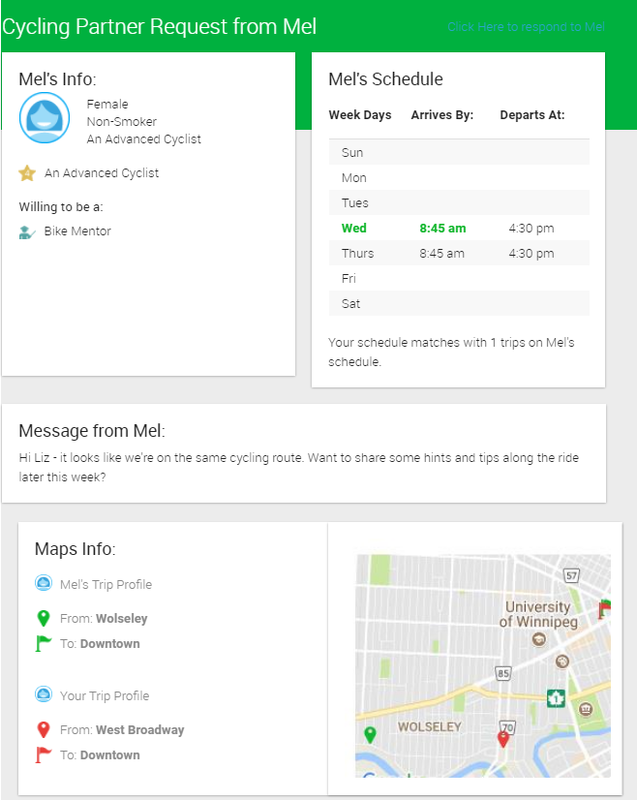 Personal Connections: With GoManitoba, you’ll be matched with possible carpool partners from your neighbourhood and along your route, going to the same general area as you. You never know what you’ll learn meeting new people in your community! Cost: You’re going to save money. Personal vehicles are expensive, from maintenance, insurance, parking, gas, it’s estimated that the average Canadian spends $6,000 a year to commute via car. Log your trips with GoManitoba to see the dollars you’re saving! We’ve heard from some users about how much more comfortable they are commuting with another person, especially when tackling tough winter roads or when navigating dark morning and evenings in winter. They found it actually made them feel safer to have another person travelling with them in their car! Some people, understandably also have safety concerns about making new connections for carpool partners through this app. We want to answer some of these frequently asked questions here. Please read on and let us know if you have any other questions/concerns about the GoManitoba platform. Happy commuting! Can anyone see where I live or work if I use my true home and work addresses for trip matching? No. A users’ exact address isn’t shown as the map is programmed to never show the exact origin or destination, and the map zoom levels are restricted to no one can zoom in on your exact locations that you enter. Users can choose to enter their origin or destination that is an intersection, park-and-ride, etc. if they prefer. Do other users have access to my e-mail address? No. Communications between users happen within the app messaging service. The app will auto-select to notify you when you have a new match; however, you can choose to uncheck this box if you do not wish to receive email notification. Even if you click this box, other users will NOT have access to your email unless you share it with them. You are welcome to communicate outside of the app if you prefer, or they can all occur in-app. No personal information needs to be shared. RideShark has undergone in-depth audits from military, banking and IT organizations to satisfy requirements for data protection, safety and security. Close to 2 million people are using this system and the numbers continue to grow as the site gains in popularity across Canada! Can I meet new ride matches at a local landmark or public space instead of my home address? Yes. When logging your trips you can enter an address, select from a drop down, or click on the map for your preferred departure area. No one can see your exact home address if you choose to use it though, unless you specifically share it with a user bye messaging them. Another way to make use is this feature is if you want to use a park n’ ride type of carpool arrangement you can select the parking lot as your departure point to find a ride match from that area. Is my information shared with any other services outside of the GoManitoba system? No. The GoManitoba app is a dedicated portal for only people registering with the system and you cannot communicate with other users in the system until you confirm your email address. No data is shared outside of the platform and we work closely with RideShark on the system. Is Rideshark a reliable company to trust with my information? Yes! When the Green Action Centre, in collaboration with our nine founding partners were selecting a ridematching platform to use, RideShark was selected because of the high level of safety, privacy and security the system provides.Nearly 2 million people use the white-labelled SaaS system. RideShark has never received negative feedback regarding safety. The system is used by Military, Banking, IT, Universities and colleges in countries around the world. More answers to GoManitoba’s FAQ’s can be found here.